Amazon.com Price: $4.01 (as of 2019-04-22 02:12:25 GMT) Product prices and availability are accurate as of the date/time indicated and are subject to change. Any price and availability information displayed on Amazon.com at the time of purchase will apply to the purchase of this product. Step on the pitch for EA Sports’ 2014 edition of this beautiful game. Experience the emotion of scoring great goals in FIFA 14. The game plays the way great football matches are contested, with innovations to the gameplay that inspire fans to build play through midfield, dictating the tempo of a match. Feel the tension as chances are created, and experience the thrill of hitting the back of the net. A new feature called Pure Shot and a brand-new ball physics system will transform shooting, making every shot attempt feel real. FIFA 14 delivers online features and live services that connect fans to the heartbeat of the sport and to each other through EA SPORTS Football Club. 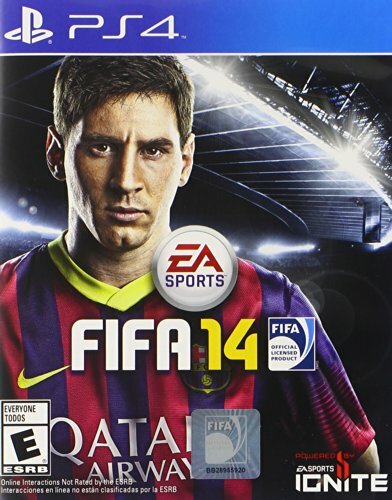 FIFA 14 is football’s social network, where fans connect, compete and share with millions of others around the world. Variable Dribble Touches – First Touch Control of dribbling varies player’s touch when dribbling with pace. Skilled players have touch and control to stand out while less skilled players will experience fewer perfect touches and more uncertainty dribbling, creating opportunities for defenders to win back possession 2nd Chance Tackles – Tackling zone has been extended to enable defenders to combine different types of tackles, recover from missed tackles, and have second chance to compete for ball in any tackling situation Skill Games – Competitive practice mode enables players to learn or master fundamental skills necessary to compete at FIFA 14 Pure Shot – Players have the intelligence to adjust stride and approach angle to find best position for hitting back of net. As well as quality strikes, players can now shoot while off balance or rushed Real Ball Physics – Realistic ball physics now determines trajectories of balls in game, enabling players to strike ball with force from distance, drill low rising shots with accuracy, and blast dipping or swerving shots, like real footballers Protect The Ball – Dominate midfield and dictate the tempo of match. Fend-off and block defenders from ball while dribbling at any speed. Protect ball from opponents to control play through midfield and dictate pace of the match. Teammate Intelligence – Better decision-making delivers tighter, smarter marking and improved run tracking. Defenders recognize opportunities to provide support and win back possession. Attacking players have new ways to outsmart their opponents and break down tighter, more intelligent defenses by creating space for themselves, running along backline and checking their pace Sprint Dribble Turn – Utilize quick, explosive cuts and turns to beat defenders one-on-one while sprinting with ball.